Got something for you to do in the gym today. 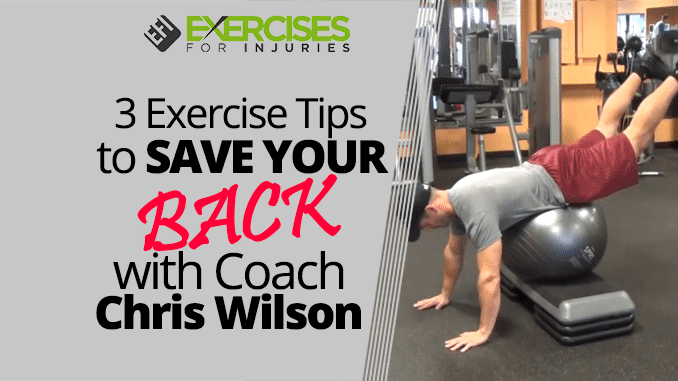 They are three exercises that you can do to help save your back from Coach Chris of Critical Bench. 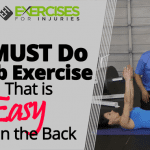 Here are three ways and in all honesty, do all three of them, to help save your back. Do it 1-2-3 and repeat it two or three times through. If you can implement this very quick routine once or twice a week to what you’re currently doing, my thought is that you will start to feel the difference when performing other lifts and your body will feel better at rest. We have a really amazing product called Fix My Back Pain that can help you with your back pain. And so these are three exercises that when done properly, with the stability ball, can do so much to fire your erectors to give your glutes and your hands strength to get that whole posterior chain really engaged. And to develop those muscles a little bit more so that when you start doing your dead lifting and your squats and some of those most crucial lifts, you are going to feel better. First you are in a prone position. You want to set that stability ball right in the center of your body between your belly button and your chest. Strong Plank Position, Arms in a “Y” and then, the “T” and then an “I“. You’re making letters with your arms. Notice my head is neutral. I’m going to hold each position for 10 seconds. The key here is you really have to stay tight through your whole body. This will make breathing a little bit more challenging. That’s good. It makes you really breathe with your diaphragm while keeping your abs tight. Okay, that’s the Stability Prone Y.T.I. Now let’s do a Leg Bridge on a supine position. I am down on the floor legs are on the stability ball. Lower than the calf, the big calf muscle, between there and your ankle that’s where you want the ball. You could push the ball a little further to make a little bit more challenging. Palms are up and then squeeze the glutes then raise the hips, body in a straight line. Squeeze it, hold it for 5 to 10 seconds and relax. Repeat that as many reps as you want. I’ll do three. Again, 5 to 10 seconds if you want to hold it for longer, 15 or 20, that’s absolutely fine. Squeeze the glutes. The arms that are here create a little bit of a helping lever but if you want you can even just do it right here and just the elbows on the ground makes the balance a little bit more challenging but very effective. You got the Prone YTI, Supine Bridge, and then finish with Reverse Type of Extension. What you want to do is put your stability ball up on top of a platform. It’s hard to find an area for a stability ball that’s big enough or high enough to really get the positioning. The best thing to do is get a board, put some riser under it and set the ball up on top of it and you want your body in inverted “V” shape. My hips are at the top, supporting myself with my hands, and squeeze my glutes and raise my legs. Somewhere in that 8 to 12 range is fine. As you get better at those, you can actually start to hold a prop between the feet like a medicine ball or something like that. If you’d do those three exercises 2 to 3 cycles once or twice a week, you will improve the strength in your lower back, in your glutes, and in your hamstrings. Your back will feel better and that will transfer to better lifts like dead lifting and squat supporting all those muscle that help you with those big lifts. Give those three exercises a go in the gym today in order to save your back. 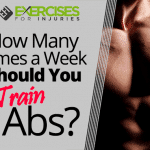 How Many Times a Week Should You Train Abs?